ARE (many) MILITARY CASUALTIES SIMULATED? Why in the world, you may ask, would western war casualty figures be fudged /or inflated? Wouldn't that cause more outrage among the public - and generate stronger opposition to these wars? No, that's not how it works, in my opinion. War propaganda is counterintuitive, and the crucial notion that "our boys are fighting and dying for our freedoms and to protect our way of life" has to be upheld. To make these wars seem inevitable and necessary in most people's minds, it is essential that they perceive the peril of a dangerous and murderous enemy. The sacrifice - or perceived sacrifice - of our young soldiers, keeps our animal instincts for 'vendetta' at high pitch. Wars without deaths would quickly fizzle out and make the public realize the truth: that these wars are nothing but rogue occupations of sovereign nations - and the criminal looting of their natural resources. So, without further ado, I will just post a series of portraits of 'war casualties' which can be found on that site. All I've done is to select groups of reported war victims from given days - and lined them up for analysis. I'll ask everyone to take a look at them and reach their own conclusions. I don't think any further commentary on my part is necessary, other than: please watch the backdrops of these portraits. Ask yourself what the odds are for these various groups of random war casualties to be portrayed against the very same background, time after time - year after year..
Marine Cpl. Kevin J. Reinhard - died Jan. 19 in Helmand province, Afghanistan, when the CH-53D helicopter he was riding in crashed. Marine Cpl. Jesse W. Stites - died Jan 19 2012 in Helmand province, Afghanistan, when the CH-53D helicopter he was riding in crashed. Marine Cpl. 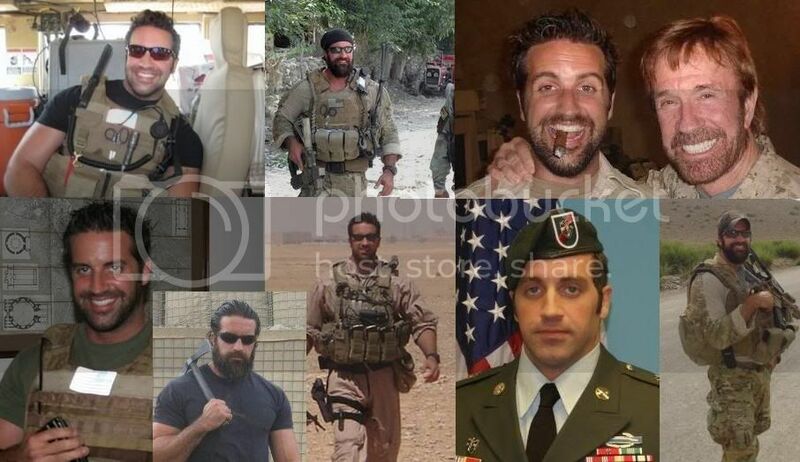 Joseph D. Logan - died Jan 19 2012 in Helmand province, Afghanistan, when the CH-53D helicopter he was riding in crashed. Army Capt. Nicholas J. Rozanski - died April 4 2012, in Maymaneh, Faryab province, Afghanistan, of wounds caused by a suicide vehicle-borne improvised explosive device. Army Master Sgt. Jeffrey J. Rieck - died April 4 2012, in Maymaneh, Faryab province, Afghanistan, of wounds caused by a suicide vehicle-borne improvised explosive device. Army Master Sgt. Shawn T. Hannon - died April 4 2012, in Maymaneh, Faryab province, Afghanistan, of wounds caused by a suicide vehicle-borne improvised explosive device. MARINE Sean A. Osterman - died Dec 16 from wounds received Dec. 14 in Helmand province, Afghanistan. MARINE Jose L. Maldonado - died Dec 17 while conducting combat operations in Helmand province, Afghanistan. MARINE Eric M. Torbert Jr. - died Dec 18 while conducting combat operations in Helmand province, Afghanistan. MARINE Kenneth A. Corzine - died Dec 24 of wounds sustained Dec. 5 while conducting combat operations in Helmand province, Afghanistan. So I guess that, whenever those Taliban "improvised explosive devices" explode (the most frequently-reported cause of these tragedies), they make sure that they kill groups of American soldiers from the very same regiment / battalion - who were all portrayed by the very same photographer - in the very same studio / location? Is this evidence enough that the US government is faking its own war heroes? Probably not. Well, I know it isn't - especially for the many skeptics of the ongoing, cutting-edge research carried out on this forum. So I will just keep digging - as patiently as ever. Stay tuned! But remember: if this discovery of mine turns out to be valid and correct - I, Simon Shack, will take all the credit for relieving the USA population of their long-lasting anguish caused by the false notion that their kids are being slaughtered like cattle in senseless wars. Of course, the American populace will have to deal with the fact that they are being duped - but that shouldn't be too hard to swallow. Or would it? Now - I'm sure soldiers get killed out there. The question is: just how many? And are the numbers possibly inflated in order to uphold the public's anger towards 'the enemy' - and therefore strenghten the public's support for the US/British/Israeli/NATO ongoing landgrab and looting of the natural resources of sovereign foreign nations? JUST as I was posting this, BOTH Cluesforum and the http://www.militarytimes.com/valor/ website went down - for about 30 minutes! A while later, the MilitaryTimes website went down again - for several hours! Re: ARE AMERICAN WAR CASUALTIES SIMULATED? 25, of Englewood, Ohio; assigned to 4th Squadron, 4th Cavalry Regiment, 1st Heavy Brigade Combat Team, 1st Infantry Division, Fort Riley, Kan.; died June 20 in West Pashmul, Kandahar province, Afghanistan, of wounds suffered when insurgents attacked his unit with an improvised explosive device. 23, of Toms River, N.J.; assigned to 2nd Battalion, 2nd Infantry Regiment, 3rd Brigade Combat Team, 1st Infantry Division, Fort Knox, Ky.; died June 20 in Molla Kala, Ghazni province, Afghanistan, of wounds suffered when insurgents attacked his unit with small-arms fire. The 9/11 movie and its vicsims has pretty much nullified anything "official" we are told. One can only wonder what has happened/what is happening over in the war zone now. I assume since their media control of peaceful civilian life is so strict, their control of whatever happens in an officially active war "theater" is even moreso. Fishy photos in place of real reporting must be the first standard of military obfuscation, no matter what -- if we want to distinguish between what we'll never know and what we'll really, hopelessly, never, ever even approach knowing. This thread was really due, Simon, thanks for starting it! It seems to me very likely that the casualties are simulated or hyped when necessary. Sure, on one hand the idea that a nation is paying a price in blood is usually seen as something politically damaging, especially since Vietnam. The commonplace wants the military to try and underplay casualties in order to protect the political elite. Thus the infamous "coffin ban" during the Iraq war. 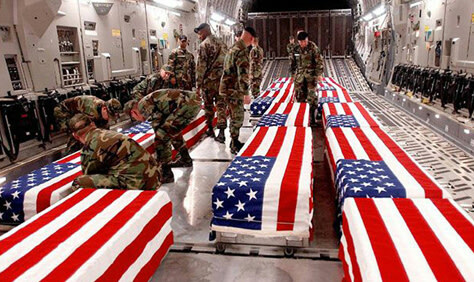 Of course today we can say that, most likely, the "coffin ban" scandal was faked, and it was probably just a convoluted way to demonstrate to anyone that U.S. soldiers were really dying in Iraq, that the danger was real, and that the military was so really invested in it to get to the point of censoring imagery. As if they did not have, by matter of course, complete and total control over any single image coming out of their war scenario. And this includes Abu Graib, by the way. That said, I am not entirely at ease with the issue of the backgrounds. I wish i knew more about it... after all it is conceivable that backgrounds are standardized and repetitive, since photoshoot sessions are probably done in series, one private after another etc. Can anyone maybe find the guidelines about this? I am sure they are written down and probably accessible, since we are talking about the global champions of control-freakness here. Also noticing that some of the groups mostly seem to be of a certain type or look, usually with one or two others thrown in for variety. The first four guys on the March 29 group all look hard and have a piercing, alert look - but the last two, who look very dull, provide contrast. The two July 19 guys look like they should be in an indie band. The August 11 guys are almost all dismissively looking down their noses at the camera. And so on. That said, I am not entirely at ease with the issue of the backgrounds. I wish i knew more about it... after all it is conceivable that backgrounds are standardized and repetitive, since photoshoot sessions are probably done in series, one private after another etc. I have now added some more material in my initial post. Please check it out. These two guys apparently both died on April 23, 2010. LEFT: "Army Sgt. 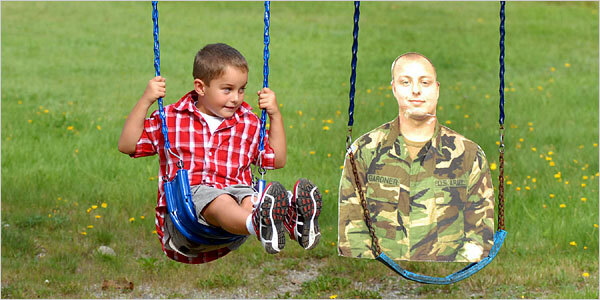 Jason A. Santora"
RIGHT: "Army Sgt. Ronald A. Kubik"
Also the memorial texts on that "valor" website sound a lot like the memorials of 9/11, as if spewed out of the same identity generator machines. "Army Sgt. Ronald A. Kubik lived life as if already two steps ahead of everybody else." However, let's not forget that each of these soldiers can be looked up in google and is bound to produce more results, more images, memorials, obituaries, local news etc, meaning that the forging of fake soldier identities would not be limited to "official" single pictures and memorials; also let's not disregard the fact that, while fake 9/11 victims were a requirement to avoid the wrath of real families, military families are supposed to be faithful to the cause or at least prepared to accept the death of their dear ones without much questioning. With this I mean that occasional real casualties might not be much of a problem for the military, and some of these guys could really be dead soldiers, even if the backdrops are photoshopped as standard procedure. This, assuming there still are genuine free agents out there actually fighting the empire rifle in hand. Here too, with this lame band innocently posing, the background looks photoshopped. Almost all pictures of soldiers seriously look like cutouts, it's amazing. nonhocapito wrote: Almost all pictures of soldiers seriously look like cutouts, it's amazing. They called them "flat daddies" or, even more audaciously, "sim therapy". Don't hear much about them lately. I don't know if this has anything to do with faking death statistics but the media reports that there were more military suicides in 2012 than combat deaths. In light of Simon's information posted above and since my first assumption regarding media reports is that they are BS, I can only surmise that there is something mighty strange going on with regards to military deaths. It takes a bit of digging, but there are stats for deaths of Iraqis and Afghans, as as result of the military occupation. The kill ratios found in that obscure pdf. were extremely lopsided at 50 to 1 or so, as I recall. No telling about the accuracy of the death count of either side, but there could be motivation to inflate the US death count so as to mitigate the impression (or actuality) of outright slaughter. 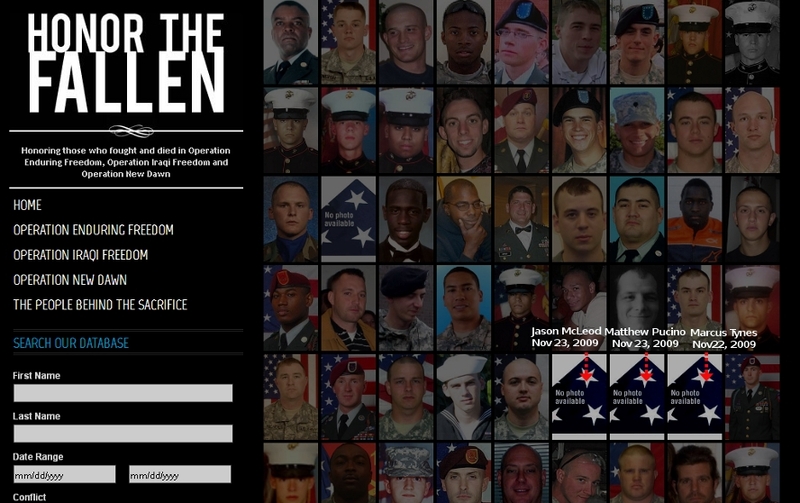 As you browse through the "HONOR THE FALLEN war memorial", you will bump into a number of missing portraits (just like in the 911 CNN memorial with its sad 'memory candles' in lieu of many 'victims' faces). This time though, those blank spots are filled with an even sadder "NO PHOTO AVAILABLE" message. Now, if I had lost a relative in battle, I would find it most offensive on the part of my government to leave out my loved one from their proud picture book of war heroes. Actually, I'd probably be stark raving mad at such an inexcusable 'oversight' - or 'clerical laziness'. But hey, maybe that's just me ! "Jason A. Mc.Leod, died Nov. 23, west of FOB Wilson, Afghanistan, of wounds sustained when insurgents attacked his unit with mortar fire. "Matthew A. Pucino, died Nov. 23 in Pashay Kala, Afghanistan, of wounds sustained when enemy forces attacked his unit with an improvised explosive device." "Marcus A. Tynes, died Nov. 22 in Zabul province, Afghanistan, of wounds sustained when enemy forces attacked his vehicle with an improvised explosive device." As you will notice, all three of them share a middle name with initial "A" - but I guess this could be put down to a mere coincidence... What's more curious, of course, is the basic fact that these three soldiers, reportedly deceased in three different circumstances occuring on two successive days - have all inexplicably been 'forgotten' by the photo editors of this war memorial. Yet, they all have (sappily) written tributes, a few extracts of which you can read below. But get this: one of the three portrait-less war heroes, Matthew A. Pucino, has not only had a post office named after him - but the Senate has passed a bill to name a bridge after him too! 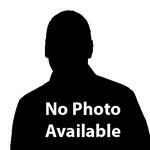 Yet there is NO PORTRAIT AVAILABLE to honor the celebrated war hero Pucino in the official war memorial ??? "Matthew Pucino could withstand the rigors of the Army — but he couldn’t sneak a pocketknife past security at Walt Disney World. His brother-in-law, Phil Haglof, said Pucino was initially asked to leave the knife in his car, but then tried to sneak it in through another entrance. 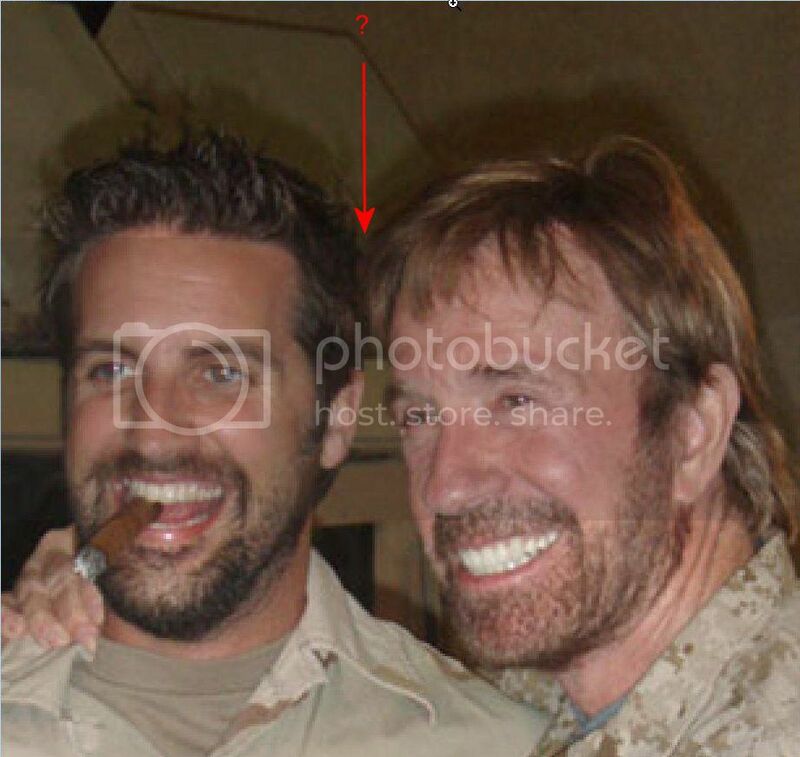 This time, a security guard with a gold Mickey Mouse badge caught him.“We always made fun of him that this Green Beret was busted by a Mickey cop,” Haglof told a crowd at Pucino’s memorial service." Looking for Pucino on Google Images, I find that he actually did look a bit like Al Pacino. Pretty funny how a foundation honoring a soldier whose main task is to kill other people does that by quoting the Gospels. Can anyone enlighten me as to why "Pucino" should wear a jacket that says "Black"?